It was just a couple of weeks ago when Texas gov. Rick Perry entered the GOP presidential candidates’ race and skyrocketed to the top of the polls. He was the big man on campus (actually, like George W. Bush he was a male cheerleader in college but that is beside the point). He was the soup of the day. He was the savior of the Republican Party. But a funny thing happened on the way to the Presidency. People began to look at Rick Parry’s record. First his Texas miracle was called into question. We learned that although Texas has been creating jobs, it leads the nation in jobs that pay only at or below the minimum wage and with no benefits. Perry also boasted that the federal govt. is too bloated and it should look to Texas as a model of how to create employment. Unfortunately for Perry, it was then revealed that Texas’ largest employer is actually the federal govt. (Fort Hood). Also despite Texas’ job growth, the state’s unemployment rate of 8.4 percent is higher than both the rate in Democratic New York and Massachusetts. Indeed Massachusetts’ lower unemployment rate of 7.6 percent was achieved despite the fact that the Bay State has near universal health insurance coverage as the result of its 2006 health reform law which includes personal mandates. On the contrary, Texas has the highest percentage of uninsured residents in the nation. Speaking of health care, Rick Perry’s adamant opposition to health care reform was also called into question this week. You see, like flip-flopping Mitt Romney, Perry was also for health care reform before he was against it. The Daily Caller reports that in 1993, while serving as Texas Agriculture Commissioner, Perry praised the efforts of then-first lady Hillary Clinton to reform health care, a precursor to Obama’s health care reform efforts. In a letter to Ms. Clinton he wrote, “I think your efforts in trying to reform the nation’s health care system are most commendable” and “Again, your efforts are worthy, and I hope you will remember this constituency as the task force progresses.” Clinton’s health care proposal was of course, a single payer universal health plan. Ouch! That is going to leave a mark which the Tea Baggers will not miss. An additional problem for Rick Perry’s Texas is that the tax cutting has led to a situation where Texas ranks 44th in expenditures per public school pupil. That has translated directly into Texas’ rank as the 43rd worse state in terms of percentage of high school graduates. This lack of academic achievement has simply provided a steady supply of applicants for all of Texas’ jobs which pay at the minimum wage or below. That probably does not bother Rick Perry all that much however, inasmuch as he was not much of a student himself. He was placed on academic probation while attending Texas A&M. We also learned this week that Rick Perry supported the liberal Democrat Al Gore in the 1988 Presidential election. Gore of course, is the champion of the global warming movement while Perry denies the science of its existence. 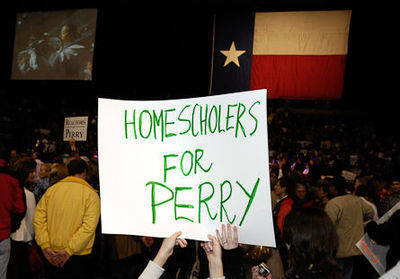 This will prove to be a particularly “Inconvenient Truth” for the Perry campaign. It appears that Rick Perry’s day in the sun is coming to an end. Republicans are beginning to chant, “Read My Lips, No New Texans!” Who will be the next Republican savior? Chris Christie? Marco Rubio? Sarah Palin? Jeb Bush? Who knows, perhaps things will come full circle and Donald Trump will re-enter the race. Please remember to click on the song link below before reading the lyrics because it is so much more fun to sing along while the actual song is playing.